The Lost Vape Orion DNA GO 40W is the very first portable device system that utilizes the DNA GO Chipset alongside the capabilities of escribe. 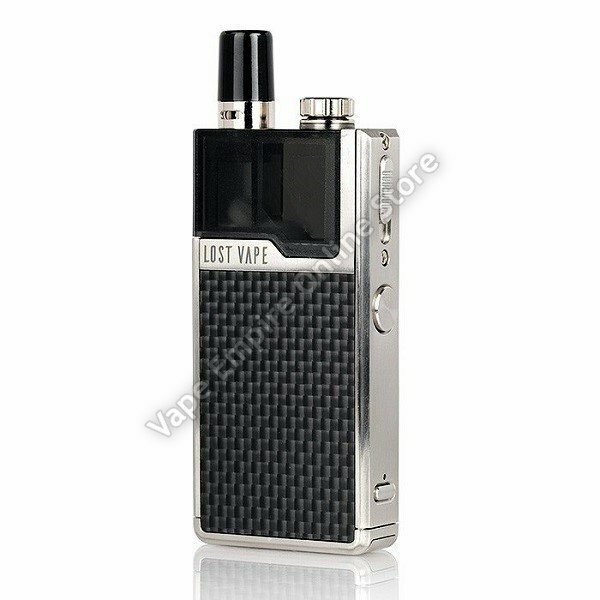 The Orion DNA GO has a continuous output of 30W with a 40W maximum boost output. The Orion DNA GO's output level can be changed with one press of a button and are color coded with White being low, Blue being medium, and Red being high. Holding the adjustment button activates replay mode; Replay mode allows users to perform the same level of consistency while providing a longer life span for the pods.The Lost Vape Orion is powered by a built-in 950mAh and can be charged via usb with up to 1A. The battery life indicator of the Lost Vape Orion are coded with blue being 100% to 95%, green being 95% to 70%, yellow being 70% to 30%, red being 30% to 15%, and when the light is blinking red it's 15% to 0%.The Orion uses two types of replacement pods, a 0.25 ohm pod meant for vaping regularly and a 0.5 ohm meant for flavor. Each pods can accommodate up to 2ml of your favorite E-Liquid or Salt Based Nicotine respectively. The Orion Pods lock into the device and can be ejected via the knurled notch located on the side of the device. Located underneath the drip tip of the pod is an adjustable airflow slot for users to choose either Mouth-to-Lung draws or Direct-to-Lung draws. The Lost Vape Orion DNA GO 40W is one of the most advanced all in one pod systems in the market due to the chipset we all know and love! This KIT selection includes two (2) 0.25ohm SS316L and one (1) 0.5ohm SS316L Orion Pods. Additional pods for the Orion are sold separately.